Hedgehogs are wonderful little creatures that have unique habits and personalities. Their response to you will depend on how you handle them and how you respond to their needs. You will need to learn to respond to your hedgehog’s subtle way of communicating and adapt to their prickly protectiveness. Our human nature is to want to reach out and touch or pet our prickly friends or to hold them close and cuddle them. As naturally shy animals, hedgehogs will require you to earn their trust before they accept your handling. Once a hedgehog is comfortable with you, they will appreciate your affection. We have found it almost necessary to “retrain our brain” and think of hedgehog handling as different from all other small pet handling. When we pick up other small pets, puppies, or kittens, we want to hold them close and pet them to help them feel safe, secure, and to help them relax. Hedgehogs, on the other hand, seem to respond very well to sitting on completely flat hands out away from our body. When we hold them close, their senses are almost “overloaded” making it difficult for them to relax. Petting is very scary for hedgehogs when they don’t know who or what is touching them. Try to keep in mind that we, as humans, don’t want anyone or anything scary touching us, and hedgehogs are no different. When holding a hedgehog, or any other small pet, it is also human nature to want to cup our hands to prevent them from falling. Rabbits or guinea pigs tend to kick or jump when they feel like they are going to fall. Hedgehogs, on the other hand, are completely fearless of falling and are not likely to uncurl or unball when held in your cupped hands. Hedgehogs will put their feet down much more quickly on flat hands where they have a safe place to stand, compared to cupped hands where they may feel surrounded and want to stay curled up. After all, hedgehogs are “big chickens” or “scaredy cats,” and it is up to us to help them feel safe and to earn their trust. 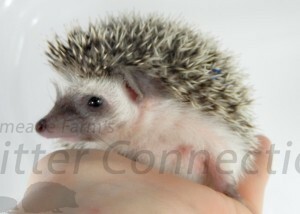 Please carefully read the Behavior & Personality Section on our website as understanding hedgehog behavior and personality is critical to proper hedgehog handling.